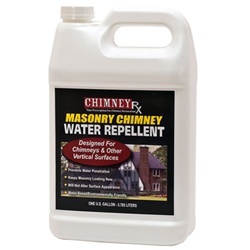 ChimneyRx Masonry Chimney Water Repellent treatment is 100% vapor permeable, which allows the water vapors to escape. This reduces costly chimney repair such as spalling, scaling, deterioration, and freeze-thaw damage that results from trapped moisture. Available in 1 gallon containers. 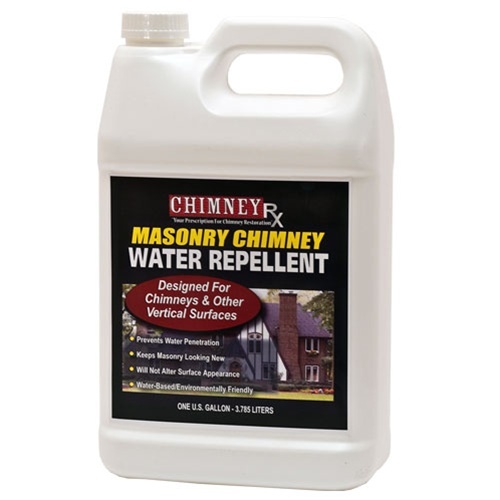 ChimneyRx Masonry Chimney Water Repellent is a penetrating, V.O.C. compliant, water repellent which contains a proprietary modified siloxane. This water-based siloxane penetrates masonry up to 1/4 inch or more depending on surface porosity and moisture content at the time of application. ChimneyRx Masonry Chimney Water Repellent reacts with the minerals in masonry in the presence of ultraviolet light and atmospheric moisture. This reaction forms strong permanent bonds beneath the surface and creates a hydrophobic zone that prevents water molecules from penetrating, while allowing free migration of water vapors. The chemical bonds formed in this process allow ChimneyRx Masonry Chimney Water Repellent to become an integral part of the substrate and provide long-term water repellent protection. ChimneyRx Masonry Chimney Water Repellent protects most vertical and horizontal exterior, above-grade masonry surfaces including: adobe, architectural concrete (precast or cast-in-place), clay brick, mortars, natural stone, limestone, granite, sandstone, terra cotta, exposed aggregate products, Portland cement stuccos and concrete masonry units. Natural substrate color and surface textures are unaffected, with little or no gloss created. Slight darkening may occur on dense surfaces.